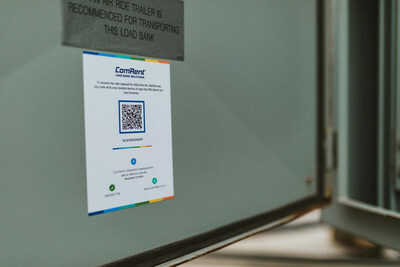 BROOMFIELD, Colo., April 10, 2019 /PRNewswire/ -- ComRent International, a global leader in load bank solutions for testing and commissioning of mission-critical infrastructure, is equipping load banks with QR codes allowing technicians to quickly and easily access user guides on their mobile devices. Load banks require an expertise to facilitate an easier, faster, more efficient setup and operation. Implementing QR codes has allowed ComRent to provide an extra layer of safety, security, and accuracy by ensuring all technicians have the necessary information needed to complete a load test effectively. "Our new system takes people straight to the information they need," said Doug May, Chairman and CEO of ComRent International. "In addtion to the user manuals, we utilize QR technology to provide easier access to additional operation and setup information. As long as people have access to the equipment and a smart phone, they can find everything thing they need to safely, accurately, and effectively operate a load bank. We are always striving to make it as easy as possible for our customers." ComRent has already successfully equipped nearly 500 units of their LPH100 and 922A Medium Voltage load banks. To take advantage of them, the user must have a smart phone with a standard QR code scanner application installed. This simple application is commonly used and is a free download for many devices. To learn more about ComRent's load bank solutions, visit www.comrent.com. ComRent International offers mission-critical customers the most comprehensive load bank and service solutions to interconnect systems faster, stay on time and budget, and reduce risk. Through ComRent's global delivering locations, 2,500-unit fleet and over 150 miles of cable, customers receive load banks faster and can confidently rely on ComRent's exceptional service and industry knowledge to do testing right the first time. Fortune 50 data centers, electrical utilities, solar and wind developers, and oil and gas companies rely on ComRent to fulfill their testing and commissioning requirements. Learn more at www.comrent.com.